After being quoted $650 for that job on top of the other things I needed and not to mention that it's not really that easy to find parts for a 20 year old Jeep it was time to give up the ghost. After many tears and trying to find another way to get her fixed we wound up salving her for parts for half of what I paid for her. So now we're looking for something new.. or semi-new certified pre-owned. Not exactly what I was hoping for, of course it never happens at a good time and not to mention good cars are rather expensive -_- But after Sandy came barreling through last October used cars from private sellers can be shady to say the least so with a dealer is the way to go... it's just gonna take a little time. Wish us luck we find a good deal and that I have something before camp starts. It doesn't matter if the kids in your life call you mom, aunt, purr or bark, love is love. Mother's Day is bittersweet for me and I don't really celebrate, it's just another Sunday in my book. My first Mother's day as a mom was my first without my mom. I only had my mom for seventeen years, some are blessed to have their moms longer, some less, some never knew their moms at all. After almost 18 years I still remember all the things my mom did for me, the lessons she taught me and most of all how much she loved me unconditionally. To all the wonderful mom's out there, I hope you all have a beautiful day! 2. 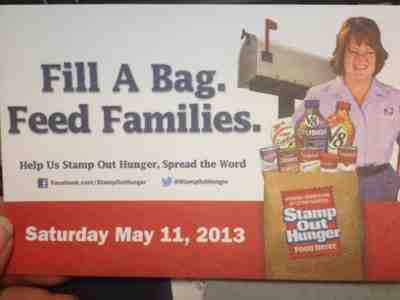 Place by mailbox for letter carrier to deliver to a local food bank or pantry.